If you’re an ice cream purist, not much. But if you enjoy the sweet things in life on a scale of decadence just tipping into over-indulgence, I’d suggest trying a scoop of gianduja ice cream sandwiched between two crispy, chewy chocolate chip cookies. It’s heaven. Or as close as you’re going to get through a mouthful of frozen dessert anyway. Chocolate and hazelnut is a winning combination – just look at the thousands of jars of Nutella sold every year. When I was little, my Mum would only let us have this calorific creamy confection as a special holiday treat. We’d eagerly slather chocolatey dollops onto thick white bread spread with butter (oh go on, don’t say you’ve never tried Nutella and butter, if not, you haven’t lived), watching the level of spread slowly recede with a mixture of sadness that it would soon be finished, and excitement about the collectable cartoon glass it would reveal. In fact I’m sure we’ve still got a few Nutella jar glasses kicking around at the back of a cupboard somewhere . . .
Gianduja, or gianduia, is a posher version of Nutella. With up to 50% hazelnuts compared to Nutella’s 13 per 100g, it’s the Rolls Royce of the chocolate/nut world; the 70%, single estate cocoa truffle to a golden-foiled Ferrero Rocher, the triple cooked chip to a pack of Cheesy Wotsits. That’s not to say there isn’t a time and place for both ends of the scale (I’m as partial to the crispy creamy crunch of a Ferrero Rocher as any of the Ambassador’s guests), but if you’re looking for smooth, sophisticated flavour, gianduja is the way to go. I do a lot of baking on this blog, but I’m also a big fan of ice cream. After several months of making my own bread and extolling its benefits, both in price and flavour, over the shop bought stuff, I started to think about my ice cream buying habits. Why spend upwards of £4 per tiny tub when I could make it at home, experiment with new flavours and use gorgeous ingredients of my choosing? So I asked for an ice cream maker for my birthday. It’s not til next Saturday, but as I’m going to be in Italy for the big day (most likely eating ice cream on the beach), I opened it last weekend at an early celebration. My Dad had also scoured Amazon looking for the best book of ice cream recipes he could find, so my ice cream maker came accompanied by the Ben & Jerry’s Homemade Ice Cream & Desserts book and a copy of David Lebovitz’s The Perfect Scoop. If you’ve read my previous posts, you’ll know that I’m a little bit obsessed with David Lebovitz‘s recipes. They’re incredible. This book is no exception, and if you love ice cream but don’t own a copy, I suggest you go and buy one right now. It’s a frozen bible of ice creams, sorbets, granitas and yoghurts, sauces and sprinkles, mix-ins and more. There’s even a chapter on vessels including brownies, blondies and how to make your own cones. The recipe below combines chocolate chip ice cream sandwich cookies with creamy gianduja ice cream. 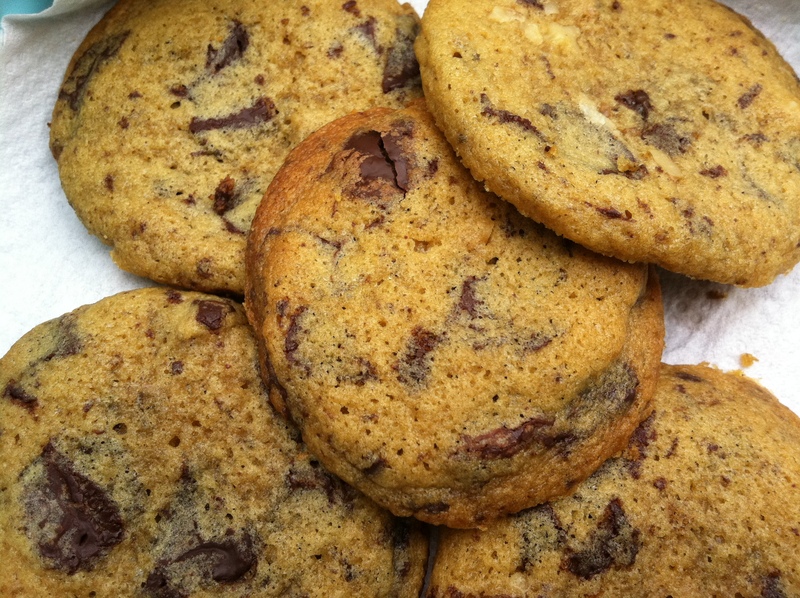 The hazelnuts are roasted, infused into the milk then removed completely, resulting in a silky-smooth finish which contrasts beautifully with the chewy crunch of the chocolate and nut cookies. Once frozen, they take on an incredible fudgey texture – a million miles from the cardboardy ice cream sandwiches you might find in newsagent freezers. Once you’ve tried this recipe, I guarantee you will never look back. Rub the hazelnuts in a kitchen towel to remove as much of the papery skins as possible, then blitz to crumbs in a food processor. Warm the milk with 250ml of the cream, sugar and salt in a saucepan. Once warm, remove from the heat, add the chopped hazelnuts and steep for an hour at room temperature. Put the chopped milk chocolate in a large bowl. Warm the remaining cream then pour over the milk chocolate and stir until completely melted and smooth. Set a sieve over the top of the mixture. Pour the hazelnut infused milk through a sieve into a medium saucepan, squeezing the nuts to extract as much flavour as possible. Discard the hazelnuts. Rewarm the hazelnut-infused mixture. In a separate bowl, whisk together the egg yolks. Slowly pour the warm hazelnut mixture into the egg yolks, whisking constantly, then scrape the warmed egg yolks back into the saucepan. Stir the mixture constantly over medium heat with a heatproof spatula, scraping the bottom as you stir, until the mixture thickens and coats the spatula. Pour the custard through the sieve and stir it into the milk chocolate mixture. Add the vanilla and stir until cool over an ice bath. Chill the mixture in the fridge, then freeze in your ice cream maker. 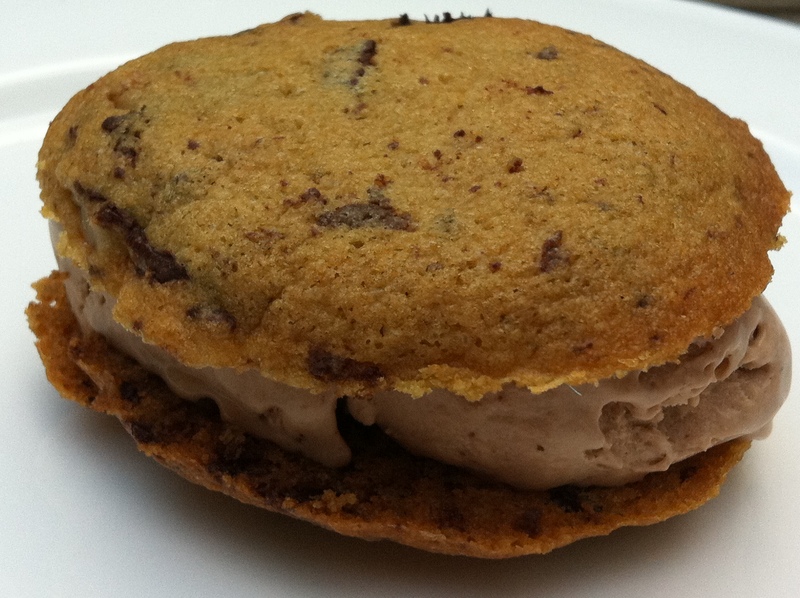 To make the ice cream sandwiches, place a large scoop of the ice cream between two chocolate chip cookies. Press down firmly, wrap in cling film and freeze until set. For a good cookie recipe, click here. Yay! I’m going to have to try this flavour (when I have eaten some of the several litres of homemade ice cream left in my freezer…). Glad you had fun, making ice cream is awesome (and addictive!). 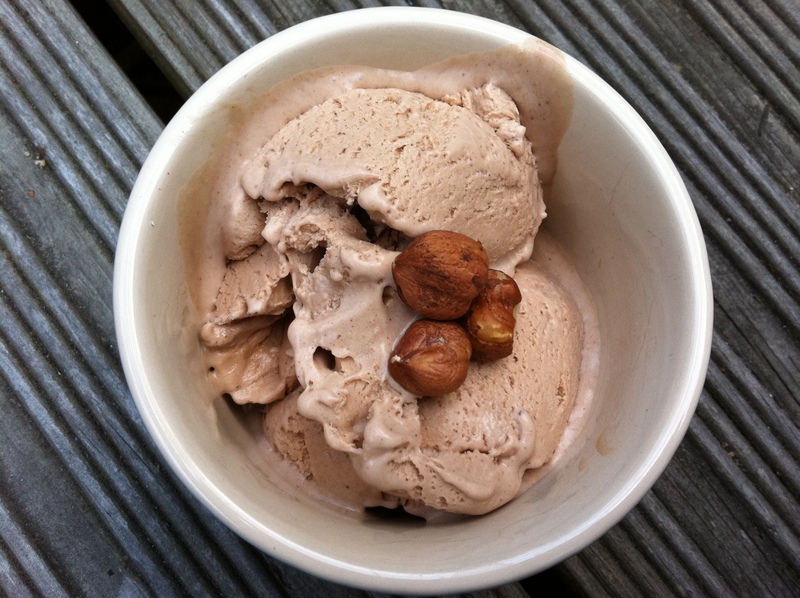 Mid post I got up to put the ice cream maker bowl back in the freezer and check if I did still have a bag of hazelnuts I’d bought for some mediocre Nutella cupcakes…I cannot wait to make this ice cream. Both it and Nutella were holiday treats for me too. The glass was precious indeed! I think I liked it better than the Nutella in someways, but now chocolate hazelnut spread brings back childhood memories in every mouthful! Nutella is the taste of childhood holidays – I don’t think I even knew you could get it in the UK until I was pretty old! Hope you enjoy the book – I don’t think there’s a single recipe I don’t want to make. God I’d hate it if someone made this for me…Don’t they have something a bit like this is Sicily for brekkie – a sort of ice-cream sandwich? I think the Sicilian version is made with brioche…would make an awesome breakfast. I’m going to Sicily at the end of August so will hopefully find out! Oh my word. I couldn’t think of a better dessert for our next bbq if I tried. Love, love, love it. They are the perfect BBQ dessert – somehow even after a massive feast of grilled meat we managed to find pudding stomachs! I’m totally in love with this, I cannot tell you how deeply I adore chocolate and hazelnuts together.